I’ll admit I had doubts but I’ve been pleasantly proven wrong. I assumed when a designer of adult fashion branches into childrenswear it can result in a line that’s not particularly childlike. Not here though, readers. Leona knows what both little girls and (equally important) what their parents will love. To say Leona Edmiston knows a thing or two about pretty clothing is an understatement as it clearly shows in her Little Leona label for little girls. I’m loving the feminine preppy look of the Collette cardigan with its gorgeous bow at the neckline and bow button detail perfect for cooler summer nights. Of course I’d have to team the cardigan with just about everything Leona has to offer. Like the Amanda Applique dress in all its red and white polka dotted glory, complete with flowers that little girls will delight in. The Sapphire skirt hasn’t escaped my coveting eye either and how could it – a tiered skirt with navy, red and white floral print, red polka dot and cherries just begs to be twirl tested. Little Leona sizing is fantastic, with items available in sizes one through to eight. 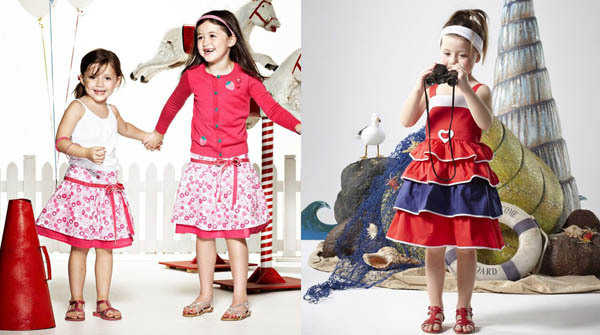 The Little Leona collection is available from Leona Edmiston and Myer.